Tiger Woods needed to come up clutch at the end of his final group stage game at the World Golf Championship match play event in Austin to stave off early elimination. He trailed Patrick Cantley from the sixth through tenth holes this afternoon, and seemed headed for his second straight match play defeat of the week. Instead, he rallied back, winning five of the next six holes to take the match 4 and 2. Woods even produced an incredible highlight in the process. On the 13th hole, a par 4, he got an eagle with an incredible 82-yard hole-out. 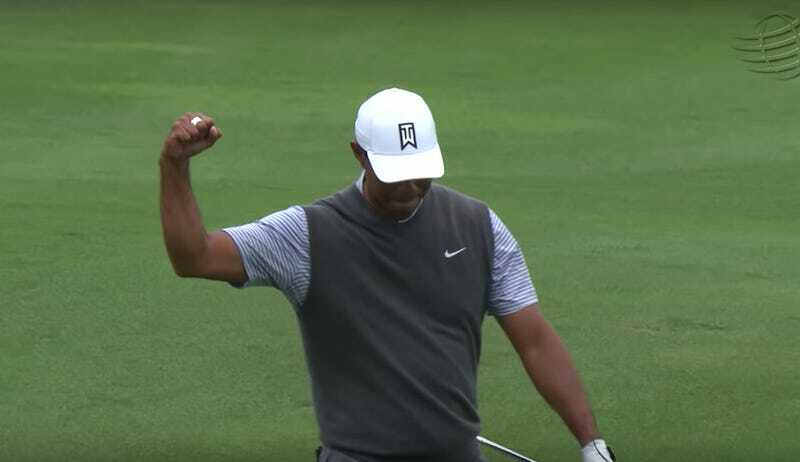 The eagle shot came one day after Woods had to get on his knees for a nifty little shot out of a bush with his off hand. Woods’s big day today wasn’t enough on its own to get him through to the round of 16, though he wound up winning the group after Aaron Wise beat Brandt Snedeker 6 and 4. That sets up a duel with Rory McIlroy tomorrow morning, which will be the first time the two have ever gone head-to-head in match play.